I am finally an owner. My 1965 HD-6B / AG mutt came home today. We knew going in that it had a problem on the left side. Initially the clutches were stuck a couple years ago so my friend soaked them with diesel and eventually got them loose. Sometime in the meantime now the left side won't drive at all. The adjustment feels like there is normal freeplay, not much on the steering levers but you can tell it isn't over adjusted near as I can tell. It runs and shifts fine otherwise, just difficult to maneuver and took a push to get it on the trailer. It does run and sound good. Smokes a little when cold and at idle but with temps and rpms in more of the operating range really not much smoke to note. My plans are to initially see if there is some troubleshooting I can do but expect I am probably looking at rebuilding the steering clutches unless there is some things I can look at beforehand. Start up of the 7000 engine. Get the cover off and see what is broken. Has a Spool type bevel gear drive so will be either in the clutch pack or bull gears outside the clutches. Does this have to be gears or shafts or could the clutch just be seized in the released position? Getting it open is part of the plan. A week ago it was working..kinda. Then just sort of gave up. The drums had been filled up with diesel for a long time to free them so possible the friction disks have given up entirely or are just slick. Going to try and put some solvent in to see if that will flush out any oily residue. The plan is to pull them out and rebuild them with new stuff but was expecting them to show some signs of working at least a little. Broken axle? Very common on an HD-6. HD3, HD5B, HD6E, HD6AG, HD6B dozer, HD6E dozer I-400, 615, ACP25, 1956 D Special Grader, AC 540 wheel loader, #84 AC plow, Simplicity tractors. Is there a way to tell? How hard is that to fix? How much disassembly required to get to this inspection cover? Anyone have pictures up somewhere to see what I am getting into? Darn shame, I knew I was into clutches which was bad enough but was hoping it wasn't anything "broken and hard to obtain". Kevin...been following along...have to concur with Cal....never seen one stuck in the free position. But what Ages Cat says is closer to what I think also. I would follow Cals advice...get the inspection covers of and see what's going on in there. Hopefully Ages and I are not right...maybe it's something simple...yes that would even include a steering clutch rebuild. Here's a post of one of our projects of a HD6 with a broken sprocket shaft....we also had a HD5 with the same affliction...it's posted also. The previous owner is a friend of mine and didn't feel any pop, bang or anything else. It just started slipping and not doing anything. I am going to see about opening it up. I don't have any kind of tools like those shown in that other thread. The pullers etc. I posted more pictures of it. And a walk around video. So today I moved it. At first it felt like that side tried to help just a little. I wonder what happens to clutch material after you soak it in diesel for 2 years... that is what has happened here and I have some renewed hope it is just so oiled down it can't get any grip or the clutch material has just completely disintegrated. I think I am going to see about making sure the drums are actually drained and put some solvent in there to see if cleaning the oily residue out helps. If nothing else it might be somewhat cleaner in there when we dig down that far. Today I pulled up the seat, shined a light in there and observed the brake drum. Very oily in there. Very. So if I hold the right hand (good side) steering clutch lever back and then start to engage the main clutch in gear, the drum will start to turn then the clutch starts slipping. The tracks do try and turn a little with this. I am not more confident that nothing is broken in there. Not to say there might not be some oil getting in there from somewhere. The case had diesel in it for something like 2 years I verified today with the plugs installed. I put 2 gallons of naptha in there but I don't think that is near enough. How much should I put in there? If I can at least have it so it can move around without having to use my "steering firewood" it would be helpful. I think you found your problem. That brake drum is also your steering clutch. If it is oily the clutch is gonna slip. The steering clutch discs are inside the drum that the brake band wraps around. Hopefully the fiber discs haven't deteriorated from being soaked in the diesel fuel for so long. Looking at the past to see the future. Duct tape.... Can't fix stupidity. But will muffle the sound of it! I agree with truckfarmers here. 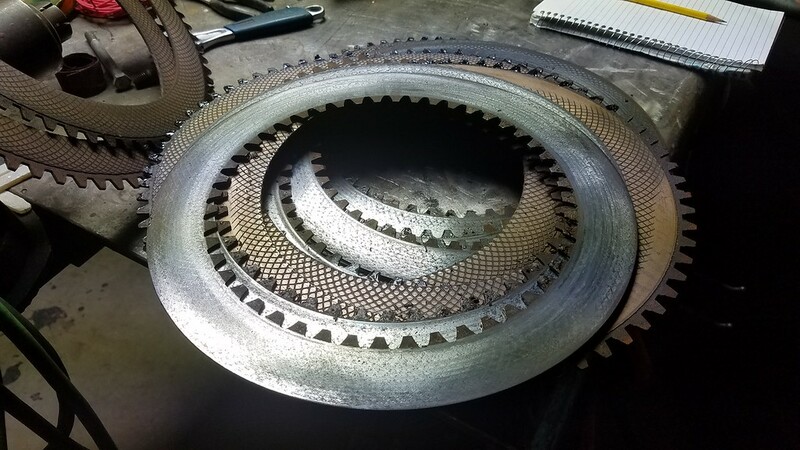 if the drum started to turn then stopped, your issue is clutch slippage whether its deteriorated disks or something/buildup preventing the clamping of the clutch disks. I would say you would want to be about 1/3 the way up on the drum with your solvent so it picks it up, but is below the shaft and bearings. I hope it works for you. My honest opinion is they have soaked too long in diesel and you are going to need to replace the clutch discs and brake linings to get proper operation. That's how my luck runs. All along before even purchasing we had a plan to rebuild the steering clutches with the modern stuff as they were stuck pretty bad. Just not looking forward to the project though it doesn't look all that bad other then getting to them. Canopy off, seat/tank off. If you don't want to have stuck clutches in the future, use the bi-metallic discs in lieu of the fiber discs as they do not stick. You will find once you get into those compartments that you may need additional parts. We did the HD5B, and had to cut one brake drum out as it was rusted so badly. We replaced the throw out bearings, grease hoses, brake bands, and used bi-metallic discs. Fortunately AC designed them to be worked on so they can be removed and installed without breaking the tracks. Haven't put it in the shop yet. I need to find a source for both sizes of plug. The smaller ones shouldn't be too bad but the bigger ones I haven't had luck with online yet. Been told to visit a Cat dealer as they apparently used a similar or same plug in a lot of their older machines. Standard pipe plugs should work. These old machines were built before metric was used on American made machines. I used plastic plugs on my hd6's. Got them from the local hardware store. Caterpillar has plugs that match those that are on my finals and also fit the empty holes. It isn't pipe thread - no taper to the thread. Should have my plugs in the next couple days and may get it moved into the shop this week after I re-organize some things. the plugs are 3/4 pipe - same on the HD5 as rear case on the 6 and 5 are the same . HD11 clutch plates are the same just differ in numbers used . 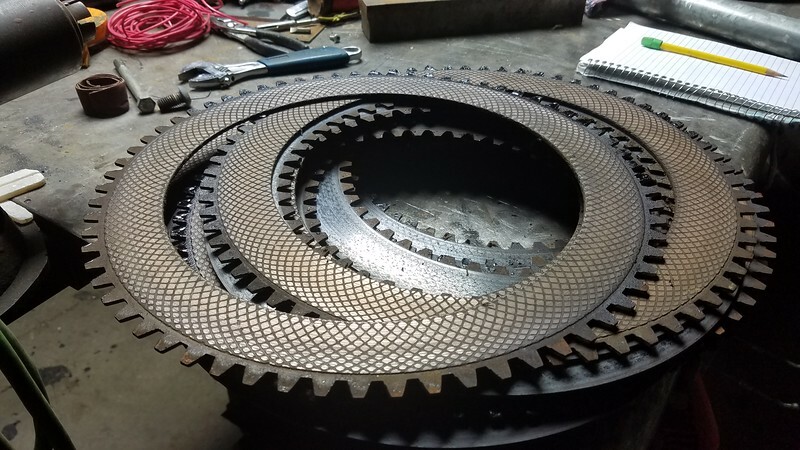 It might be all the fiber plates need replacing - and or the tabs on the clutch material have sheared off allowing the drum to turn without locking it to the hub . Faith isn't a jump in the dark. It is a walk in the light. Faith is not guessing; it is knowing something. OK today it went into the shop. Ran into a number of rusty bolts and the canopy was a problem so we took the side skirts off just so we could get it off with the limited height we were working with. Read we torched the wrap around section of the lower portion of the canopy on this machine. Plan to revise the mounting to more of the frame area instead of just the fender. I took probably 6lbs of grease and gunk out of the bottom of the left hand clutch housing. We also took a peak at the ring and pinion. Some wear on the pinion but not enough to consider it a problem. No abnormal wear on the ring. Closed that back up. Left hand clutch wasn't too bad to get out but we had to make a custom wrench to do it. Rebent with heat and welded on some extra steel to get enough leverage to get the bolts out. Time consuming and once we figured out the brake band business not too bad to get it out. No oil in the plates so that doesn't seem to be the problem. Also it has the sintered friction plates. Most all of them measure out on the low end for thickness and so do a lot of the steels. Springs seem right about spec. Had 13 frictions and 12 steels. (That seems off) We used the starter to bump it forward and it turns everything but the output of the clutch is slipping it appears. After the clutch was out I grabbed both flanges and wiggled to see if anything was broken. So far nothing that I can tell so focusing on the clutches. Planning on ordering a bunch of new parts tomorrow to rebuild both clutch packs. 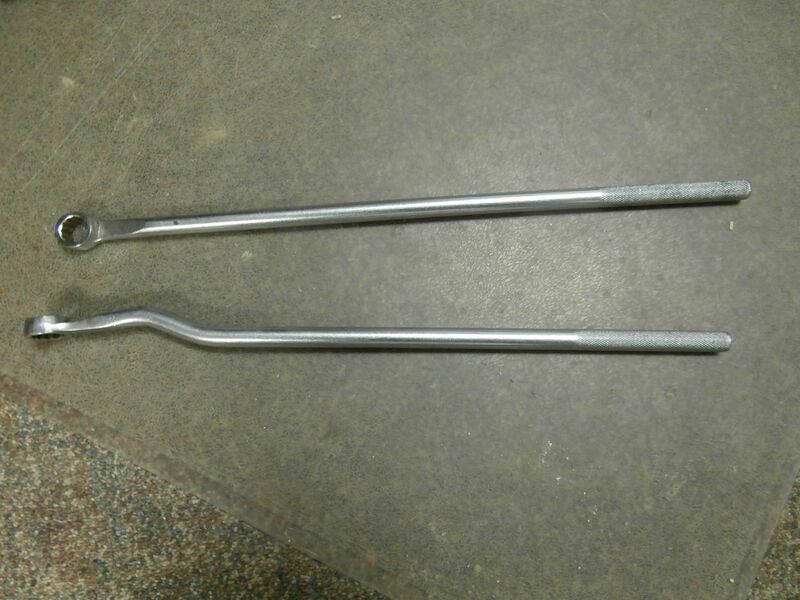 So does your homemade wrench look anything like this? I made this one about i965. Always thought I should have patented it. Ok...so following along here...I'm not seeing any smoking gun in the steering clutch. You have bi-metallic..not fiber discs..so they didn't rot away..If they measure with in the tolerances...and they certainly look good...the steels too....and the springs too. 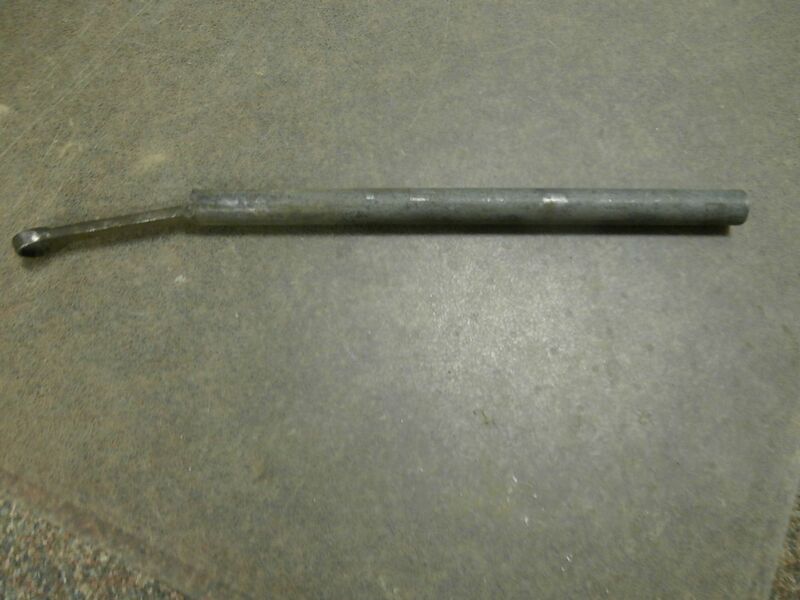 So "humor me"....I see you wiggled both the hubs...I would try to turn the brake drum hub on the pinion gear with a long bar...put some studs..pins...bolts..something long enough to use a pry bar on to see if you can turn it. Somethings not adding up here??? ?